The Associated Students of Oregon State University, OSU Sustainability Office and the OSU Foundation have launched the university’s first fundraising effort focused on reducing university carbon emissions. Addressing climate change means setting ambitious carbon emissions reduction goals – and doing everything we can to meet them! So, for the first time ever, we are partnering with the OSU Foundation to raise money from donors to fund projects that reduce carbon from campus activities. Because we have never done this before, we are unsure of the donor appetite to support an initiative like this. So we are starting with a modest project. The Foundation has set up this page for a small project in Kelley Engineering Center, which would save around 2,000 lbs of carbon emissions annually. 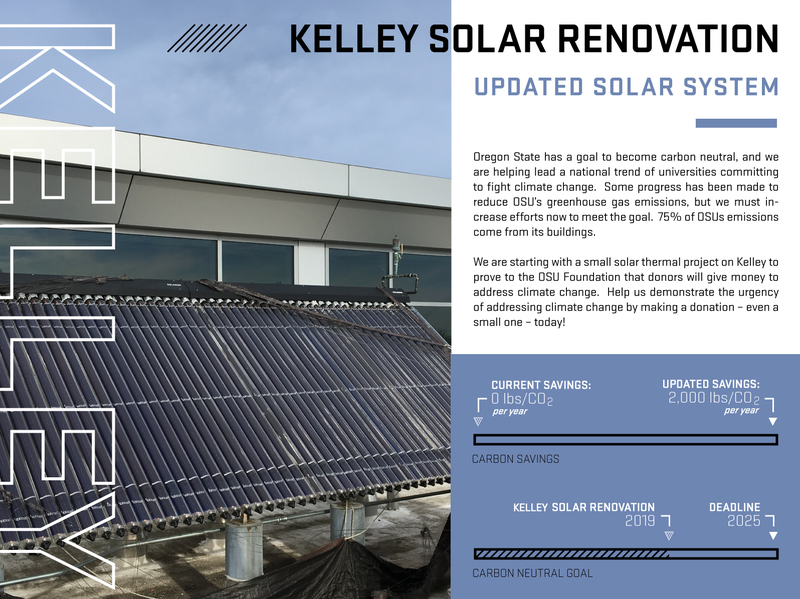 The project repairs a solar hot water system on the roof of Kelley that has been consistently problematic and, in recent years, not functioning at all. The project will replace the collector assembly with more standard technology that allows lower maintenance and more continued operations. The project also provides student engagement and research opportunities. This helps reach our objective of using the campus as a living lab, and providing real world, applied learning for our students! This project has only a $7,500 fundraising target, but what makes this so big is that this is the Foundation’s test for donor appetite. If we meet this goal and things go well, the Foundation will invest their resources in fundraising for larger, more impactful projects and use their networks to garner larger contributions. Even if you can only give $10 or $15, please contribute. This project is as much about demonstrating the number of donors willing to contribute as it is about dollar amount. Please use this link to donate, share it with everyone you know, and together we will start OSU’s major carbon reduction fundraising campaign off on the right foot!